Unable to connect to master or target server 'xp0_Processing.Pools'. You must have a user with the same password in master or target server 'xp0_Processing.Pools'. The error occurs on Deploying package to database stage. My install.ps1 is created from the official Sitecore Installation Guide, $SqlAdminUser, $SqlAdminUser and $SqlAdminPassword parameters are set correctly. What can be the reason here? I had the same issue when I tried to install Sitecore 9 with MS SQL Server 2017. The Sitecore 9 has the MS SQL Server 2016 in the prerequisits. Unfortunatelly it looks like the newer versions are not supported. Try to install the MS SQL Server 2016 and re-run the installation. 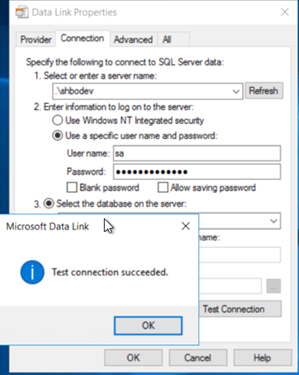 You can also run in to this error when the credentials are not correct for $SqlAdminUser and $SqlAdminPassword for the SQL instance specified in $SqlServer, from the PowerShell script on page 34 of the installation guide. I have successfully installed Sitecore 9 with MS SQL Sever 2017 Express. I had encountered the same error and the trick is instead of using $SqlServer="localhost" in the installation script, change it to $SqlServer="localhost\SQLExpress". If you are indeed using the Express version, doing so should avoid the above issue! Basically this error comes when xConnect setup script is not able to connect to SQL server. 1) Please check whether SQL Server credentials contains $ , powershell will ignore characters after $ , remove $ and then try. In my case the user "sa" was locked out. I had to unlock it in SSMS. Expand the server => Security => Logins => "sa", rightclick => "properties" => "status" => Uncheck "login is locked out"
Mine was in SQL server 2016 only. I did not need to install 2017 or re install 2016 again. I have modified the following attributes on install.ps1 according to my local machine settings and that fixed the issue. $SqlServer = "localhost(SQL server instance name if server name is not localhost)"
Its always better... whatever you are giving the value, please use the same in SQL Server Management Studio.. If you are able to connect using SQL Server Management Studio, use the same details in your powershell script file while installing Sitecore 9.0 or Sitecore 9.0 Update -1. After getting this issue myself trying to set up a new machine you will have issues if you have SQL Server 2017 and use only the dependencies mentioned in the installation guide. Once I installed this version I had no trouble running the scripts. I encountered with this error when my install script had $SqlServer = “Servername” defined as the value for $SqlServer was not correctly assigned. This correct value for $Sqlserver parameter should be “$SqlServer = “.\Servername” or “machinename\Servername” or “localhost\Servername”.